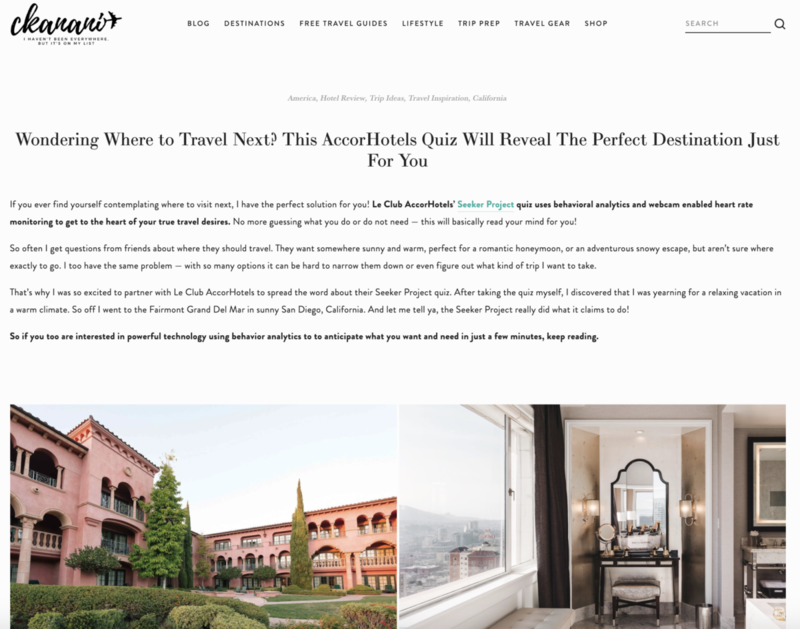 When members of our team first took AccorHotels Seeker Project online quiz, we were fascinated and mesmerized by the results. We wanted to tell everyone about it – and found that our influencers felt the same way. To echo the feelings we had from the online quiz, we created a dynamic, interactive and highly successful campaign that truly created ambassadors from the influencers – with them sharing over 4000 social media posts about the quiz, the new loyalty program, and AccorHotels. Drive Traffic + Build Awareness: AccorHotels was launching a new loyalty membership program – Accor Le Club, a membership that would combine several hotels existing loyalty memberships into one, new program, complete with new perks that would be available to long time members as well as new ones. They spent months researching how best to release this new program, wanting to be very careful with presenting the concept to existing members and very enticing for new people to join. This campaign aimed to show how the Seeker Project — an existing campaign activation designed by Accor Le Club to pair new and existing customers with a vacation destination matched to their specific needs and desires — works through unique content and social promotion. 85M Impressions: When combined with influencer trip promotion, a one-hour sponsored Twitter Chat, content views, and post-influencer-trip promotion, this campaign sought to achieve a minimum of 85M impressions. 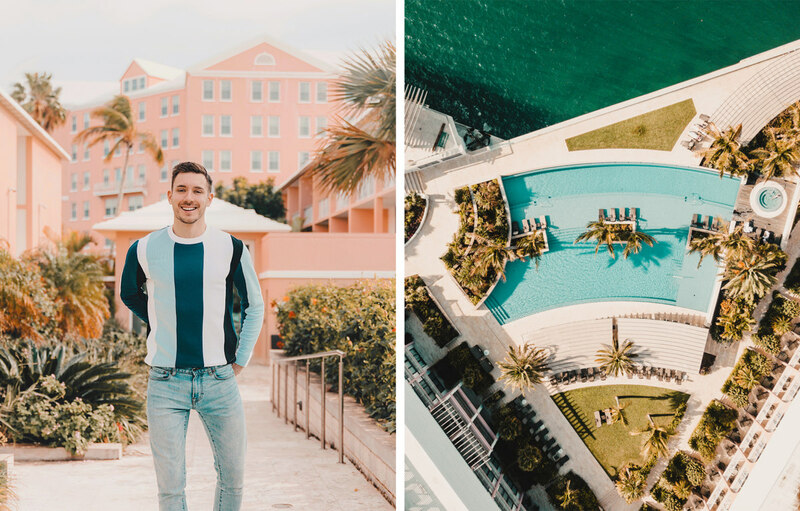 30 Pieces of Content: Reiterating the influencer experience through thoughtful storytelling, the content should focus on the influencer trips, each specific property and their unique highlights, and how the Seeker Project weaved together the entire experience. This content is to be housed on influencer blogs and Travel Mindset’s consumer website. 500 Social Media Posts on Influencer Channels + 100 Social Media Amplification Posts on Travel Mindset’s Channels: Throughout the length of the campaign, the influencers and Travel Mindset would share a minimum of 600 social media posts across Facebook, Twitter, Instagram, and Pinterest to improve brand affinity. This includes influencer trip promotion which occurs before and after each individual trip, in addition to standard content promotion. 10 influencers would be selected based on their social media and blog performance, their compatibility with the Fairmont Hotels and Accor Le Club brand, and their target audience demographic. These influencers would complete the Seeker Project quiz which would then pair them with a property to visit based on their unique niche and travel and lifestyle preferences (adventure, family, urban, tropical, etc.). The influencers would travel to these unique destinations, highlighting their Seeker Project results (which brought them to said destination), the property it paired them with, their experience with each property, its amenities and activities, and their level of satisfaction with the entire experience. All of this would be highlighted on social media (especially platforms that are compatible with real-time promotion, like Instagram Stories, which allow the influencers to give a holistic view of the entire experience) and in post-trip content. This was one of the most unique campaigns for Travel Mindset due to the number of influencers and unique properties covered over a set period of time. While promotion sought to cover each unique property, it also worked to push consumers to a specially designed brand experience, the Seeker Project, which implemented a value proposition personalized per consumer. This set of influencers acted as an amplification of this brand initiative by giving the target audience an inside look at what the entire experience would look like and leading them to the starting point: the Seeker Project landing page. Each influencer trip was completely different from the other. They took into consideration holidays and events (like Thanksgiving, Christmas, and New Year’s Eve), specific audience demographics (such as gender, marital status, family size, sexual orientation, etc. ), and special interests and themes (outdoor adventure, self-care, sustainability, urban exploring, etc.). Because this campaign utilized a large number of influencers and several trips spread out over a long period of time, we were able to effectively promote the brand to a number of unique niches and demographics. Because this campaign was so large, we implemented content strategies to tie the entire brand message together. Some of these strategies included an Instagram Takeover on Travel Mindset’s channel (2 photos from each influencer trip highlighting their unique experience, all of which was published in one day) and a Twitter Chat (a one-hour themed chat on Twitter where influencers share their experience and content, and where consumers can engage directly with the brand, influencers, and content).